At that time, Guan Min-lü and his good friend Xiao Bo-zhi always hang out together. Min-lü is secretly in love with Li Xin-rui. And Bo-zhi likes Xin-rui’s best friend, Cai Xin-yi. They share the shining young days together. However, they need to face reality. Can they maintain their friendship after their high school graduation? Not another copy cat. That was the exact line in my mind when I first watched the trailer. While I’m not a fan of Giddens Ko’s 2011 “You Are The Apple Of My Eye” (那些年，我们一起追的女孩), there were still some similarities with high school romance film 2015’s Our Times (我的少女时代) and 2014’s Café. Waiting. Love (等一个人的咖啡). While I try to keep preconceived notions to minimal by not watching trailers, the damage was done. The comparison was inevitable and unavoidable. So for those who have watched the above mentioned 3 films, and wonder if this is something you should watch, I would say, if you like those films, you will definitely like this movie too. At first glance, “At Cafe 6” is a film that has the coming-of-age & long distance relationship element like that of “You Are The Apple Of My Eye” + the love for coffee like “Café. Waiting. Love” + the use of flashbacks and different actor for the main characters like “Our Times”. But just like the quote used in the film, “Everyone has a similar youth, but a different life.” (每个人都有类似的青春，但是却有不一样的人生) So while I see some resemblance, I soon realised how apt the sentence was. Don’t we all like the predecessors because we can relate to them? I noticed the little nuances and how the author/director handled the situation. While there are also Taiwanese-vulgarities, this film was more philosophical and “dreamy” than the other 3 films. It was fun to watch quartet interact within themselves. Guan Min-lü was the quiet and suppressed one, while Xiao Bo-zhi was noisy and crazy. Xin-rui was the ace student and she’s gentle while Cai Xin-yi was loud and tomboyish. The chemistry was simple and fun. One couple take care of the sweet and romantic moments while the other provides comedic relief. The one part where I think this film was better than “You are the Apple of my Eye” was the way long distance relationship was handled. Neal Wu discussed not just about the physical distance, but also the maturity differences. The budding romances within the characters were sweet and pure. The relatable characters will brings audience (especially those born before 90s) happiness and nostalgia. No smart phones, no Facebook, no internet to shorten the distance. Then it comes to the coffee part. If the coffee in “Café. Waiting. Love” talks about waiting, the coffee in “At Cafe 6” will have 2 different representations. At the start, the appreciation of coffee was a symbol of education and the outside world. As Xin-rui started working in a cafe while studying in the university, she is exposed to a different world and learns to appreciate different things while her boyfriend Min-lü was not. Later on, the coffee and café became a preservation or even embodiment of an old memory. In this film, Leon Dai (戴立忍) opens the scene as the cafe owner and the narrator of the school day memories. This might seem similar to Our Times, where Jerry Yan and Joe Chen were used as the older version of Darren Wang Dalu and Vivian Sung. There was a lot of hype (+ criticism) back then on that decision, but here, I can assure you, I think Director Neal Wu made the best decision when he got Leon in this film. He was the best (and saddest) thing that happened in the story. With no resemblance to the youths, he was able to reveal his identity and his emotions just by doing their signature actions. The actors were great with their acting, same for the veteran cameos. There are many more things which I would love to talk about, but I think it will spoil the film for those who have not watched the movie or read the novel. While this film has elements similar to the previous Taiwanese movies, they are expressed in a different way and dealt with at a deeper level. I will keep it as that here and leave the rest for you guys to judge after watching the movie! So will I recommend you guys to watch? Definitely yes. At Café 6 movie (六弄咖啡館) is Neal Wu (吳子雲) first debut as a director for the novel he wrote. He wrote it under the name of Hiyawu (藤井樹) and the film was voted by online fans to be the number one most anticipated book to film adaptation. There was a fight scene between the two best friends after a funeral. It was an emotional scene and Dong Zijian (Guan Min-lü) dare not look at the playback. Austin Lin (Xiao Bo-zhi) who injured his arm during his previous fight scenes was aching badly during the shoot. But due to several hiccups, the actors were called back and the scene was reshoot three times. For this movie, social media personality Ouyang Nini cut off 25cm of her long hair. She was due for several publicity campaigns but due to news of her getting someone to replace her for her examinations and missing her gymnastics competition, her events were all cancelled. Stephanie Sun was invited to sing the theme song 半句再见 for the movie. This was the second time she worked with Neal Wu. The first time was in 2011 when she sang the song “When Winter Night Begins” (当冬夜渐暖), and Neal Wu was the lyricist. Check out At Cafe 6 (六弄咖啡館) Facebook Page! 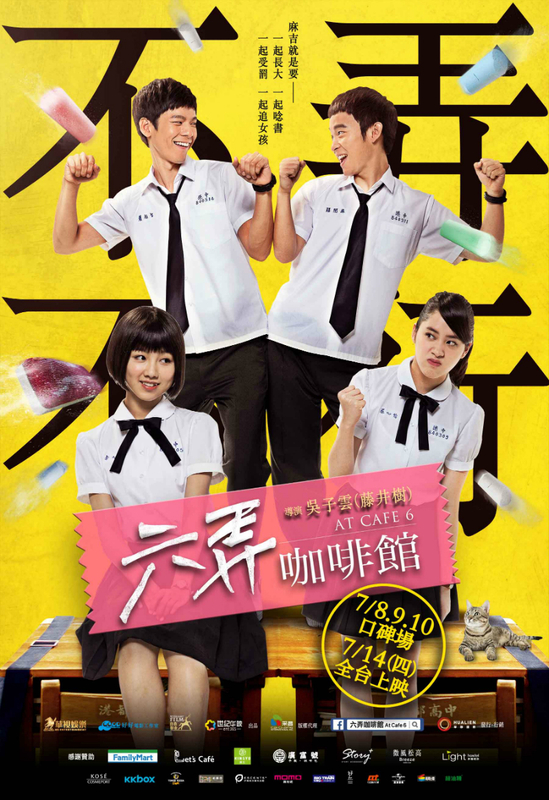 At Cafe 6 (六弄咖啡館) is out in cinemas on 14 July 2016. I like your writings regarding At Cafe 6. You are young, cheerfull and joyous. I wish you will find someone who can cheer you up, give a secure feeling, accompany you whenever you need to. Beautiful-school time past quickly. It can not be returned. In real world, a gentleman sometime can’t do what is expected: too rational or too sturdy. Yes, it is hard to find someone we needed. But possible. What Xi Rui affraid of was more likely that she had a hope which her relation with Guan will face a problem. The movie message was clear that hope something good, something best…then it will become good or best. Don’t do the opposite way! Otherwise you will suffer in loneliness as shown at the end short shoot: Xin Rui with her Xiau Lu cat. Is she lonely? Not likely since she enjoy her live with her coffee. But anyway she infact live alone. Gan Qin (relationship), care, intimity and openness had to be held throughout life long. Then beautiful life memory of a youth time still flourish endlessly. Thank you for your blog post about this movie. I’m just watched it, while Bo Zhi open the old letter, and Min Lu said that he was really sorry after the pass of his mother and then his unsuccessful love story with Zin Yi, I realized that Min Lu committed suicide. What an ending!!! Actually I hate this ending hahahaha.. I still denied it, and I google about the ending, and I finally found your review, and yes.. he suicide. Gosh.. But this movie successfully dragging us into young (and reckless) memory. This is really quite funny movie, with sad (and confused) ending. My mistake. “…then his unsuccessful love story with Zin Yi…” What I mean in this, his unsuccessful love story with Xin Rui. I’m lil confused with Chinese name. Sorry. I guess it really depends on how you look at it. If you realised, the director showed a lot from the angle of the guy, what the guy did, how hard he worked, but he did not really show what the girl did too, so it’s easy for us as audience to assume that she didn’t care enough. Here’s the story talks a lot about the way one expresses their love. The guy expressed his love by saving money and doing the company, but what the girl needed was a cuddle and comfort when she just got robbed, him putting some effort in appreciating the coffee she did, and them working towards the goals of going overseas together. But the guy was just happy in his routined life. Thanks for your marvelous posting! I definitely enjoyed reading it, you will be a great author.I will always bookmark your blog and will eventually come back at some point. I want to encourage that you continue your great job, have a nice day! I have question who Bho Zhi ended up with? at the end scence where he kissed his before he went off to the sea? That’s the childhood girlfriend (good friend of Xin Rui). If you happen to have the movie, there’s a scene where he put down the letters, and the name on the letter is the wife’s name. Hi, I love this movie, my question is, does Guan Min Lu really suicide? and does Xin Rui marry somebody else, I know she still call her cat Little Lu, and , I cannot read chinese explanation by the author(somebody give the link) because I wanna an explaination what really happens. Hi there tiffany, if I can call you that. I want to share my unclear thought about the night scene where Xin Rui seems like running away from someone in an alley and then she called Min Lu while crying. Was that just a robery scene or something more happen to the girl? Like physical incident maybe? Okay.. so that’s what happened. Because Xin Rui looks a bit pale there I thought I missed a detail. Thank you for sharing. It’s a nice movie tho. Glad you agree with me! And thanks for sharing your thoughts! No, I didn’t. It’s not airing yet in the cinema here, I think. I am curious of the storyline, such a new air from Giddens Ko. LOL. Why did you say so? Hi Kawaii Chan, yes he did (commit suicide). This was the reason why his friend told the girl this story. He wanted to let her know that some things which seems terribly painful now might become very insignificant later on. He didn’t want her to follow his friend’s path. Firstly, thanks for the review. Think the last 1.5secs ended the story for Rui pretty well. The location is clearly someone in the city. In a high rise apartment. Meaning she has moved on with her life, but the mug shows she still is in touch with the school mates. And when she calls the cat Lu, it shows that she actually named the cat xiao Lu on her birthday. The day they broke up and text him “u are not here” and by naming the cat Xiao Lu, she is helping him full fill this wish to be “always there for her” like the msg the tape. Over all it’s a decent movie, but for me, half way through the movie I already expected the ending. Cause they totally forgot about the best friends romantic plot line, which means it’s likely to be him who got the “happily ever after”. You mean you expected Guan Min Lv to commit suicide? Excellent movie! Their silly signature moves cracked me up in the few instances it was performed, but towards the end when it was repeated, I could not laugh anymore….. it was painful. Sometimes girls just need to be cuddled and comforted. 🙂 I’m glad you learnt something from it. Hello, today me and my girlfriend went to watch this movie “At Cafe 6”. We had the whole theater to ourselves since it was a Monday afternoon. I can say it was really a good movie, and after which I went online to look for reviews regarding it. I came across yours, and find it well written but the thing is my girlfriend and I didn’t stay for the post credit which you mention that there are some more stories regarding the lead. Can you tell me what happen please ? So we can safely assume that the girl is Xin rui, and to answer the question Guan Min Lv asked her many years ago when she was given the cat, the name of the cat is still Xiao lv. So… she hasn’t forget him? Maybe. I see, thank you so much !! After watching the movie a few days ago , unfortunately I did not stayed for the end credit scene also. Concurrently I was searching for the movie reviews of At Cafe 6 and stumbled upon your review. I decided to watch the movie again with my girlfriend to check out the post credit scene. And of course I was quite confused as I thought the main character will appear , or there might be a wedding photo of him and Xin Rui. Instead a cat appeared and Xin Rui said Xiao Lui. Dayum. Nonetheless my curiosity has been answered but still , 14 bucks bro. I regret nothing! Hey Edward, nice to hear that you supported the film again! Maybe try reading the novel to see if you can understand it more? Haha… the novel is available online! Hi… not sure if correct….I believe the ending is actually Min Lu married Xin Rui as he placed the letters collected from the mailbox addressed to her on the table and walked in to kiss his wife who is Xin Rui. Thereafter he opened the box which he read the letter addressed to Bo Zhi about he missing the date… I assume that the letter was written just after he missed the date… the letter was not sent out… I assume this meant that he never had a chance to send out as Bo Zhi passed away in an accident shortly after… which is why he continue dancing by the sea a friend whom he missed…. Hi Lester, this was the inital misconception most people have. The letter was not Xin Rui, But Xin Yi (which was Bo Zhi’s crush & Xin Rui’s bestie). Their names both have a Xin, which might explain why you might have misread. I don’t think there’s any part showing Bo Zhi passing away, because the older guy is Bo Zhi. If the older guy was Min Lv, the flashbacks wouldn’t be off him but more of Bo Zhi. Also, if you’ve stayed till the end, there will be a short snippet showing Xin Rui saying “Hi Min Lv”. Assuming Min Lv is the older guy, and Xin Rui is that sleeping wife, that scene wouldn’t be necessary. 🙂 Hope this helps! Hi Tiffany, I’m just wondering, does Lu kill himself because he felt really guilty of his mother’s death or because he thinks Xin-Rui has other guy already…. Secondly, why did on the suicide letter, Lu wrote “you have a familiar face”? Did he hope that Zhi do whatever he should to make her happy including marrying her?? Thankssss!!! The ending showed the photographs of their youth and the picture he drew.. and the cat Little Lv.. does that mean she grew up never married, and still resides in Taiwan, despite her dream to go to Seattle to explore further for her dreams ? Refreshing change compared to the usual sci-fi, action and horror movies. I remain the fan of those genre though. I love these kind of romantic mushy movies and actors are really looking so cute. I think it can’t be helped for people to compare this film with You Are The Apple Of My Eye. The theme may be similar but Cafe 6 has a lot more cheesy and comedic dialogues. I am not familiar with any of the titles you have this movie compared to but I bet this one is interesting. Are they be availing this movie worldwide? I love this kinda movies! Reminds me of Cafe. Waiting. Love and You are the Apple of My Eye. Will have to catch this! It looks like a feel good movie that chronicles friendship journey. This would really be a nice movie to watch. Romantic comedy movie are my favourite. Just love to watch such movie.Would also try to watch it. I think we need romantic movies such as this, they are great in between the superhero movies and the horror movies as well. It’s such a mood booster when you watch something about love! I didn’t know this was from a novel! I enjoyed reading the movie facts! I am not familiar with the previous movies but it would be nice to see them as they sound really lovely. I like movies like this because they are refreshing and a good break from action or drama. It’s light and it’s nice to watch during the summer. The movie does not seem to be something I would like to watch based on the photos. But wow, that rating of 4.5/5 does make it something I would try to see if I get the chance.